Sunday Morning Soliloquy - Musings of an Urbanite: What Do you DO? I get asked this question a lot and many times I have a difficult time answering this question. Sometimes I am not 100% sure what it is exactly that I do because it varies. I know what I would LIKE to do, and I know what I am good at doing, but sadly, I am not independently wealthy, so I often "DO" what I can. My background is in Event Marketing but I wanted to make the shift and work more closely with Social Media, or at least create a marriage between the two. Many people do not think this makes much sense but it makes perfect sense to me. I've always been in the business of communicating to people on an emotional level. You go to a concert because YOU LOVE that band...and my client sponsored that act. You go to that art show because YOU LOVE the arts community....and my client sponsored that show. I connect people with brands on an emotional level in an effort to create a deeper, more meaningful relationship. Whether it is events or social media, when done well, both create that same result. Events. I manage B2B events, customer events, post trade show or conference events, but not as many as I would like. I plan parties for companies who want to entertain their customers while ensuring that their customers know why they're at this party through branding - subtly. Again, like social media, events are a soft sell. I also plan dinners and events for groups coming in for conferences, this is less strategic and more tactical but adds a nice balance to my workload. Consumer based events. If a brand is trying to break into a new market or create brand awareness, they need to offer your customers value. Hosting a meaningful event for a particular audience is a great way to introduce a new product or re-introduce an old product to a new segment. From time to time, I host events for venues but 99% of my "TweetUps" or happy hours are for fun and I don't make money from them. There are various reasons I host events where I make $0.00. I do it for many of the same reasons that companies throw events. If you know anyone looking to plan and execute and event marketing program, a customer event or a group dinner, I am your girl. Just send them to my "work" site Lotus Marketing. I am creating a sponsor driven scavenger hunt that is 100% social media focused. Participants must "apply" to join the competition. They check in at sponsored venues on foursquare, post to facebook & Twitter. The FIJI Water Urban Hunt will take place on August 7th and you can join the Facebook fan page for the time being. You can also follow @urbanhunt on Twitter for updates! I recently started to work on a few projects for some new clients and continue to work with existing clients. Twitter feed feed and facebook fan page. The fan page has about 300 fans at this point and the Twitter feed just shy of 600 followers. Additionally, I write their travel blog which gets about 1500 hits a month (their main site receives about 1200 per month). I don't think any ONE item gets a tremendous amount of traffic but the combined effort results in about 5000 additional impressions each month than the agency had two years ago. Their business is up by 50% over the past four years. I manage their marketing communications, including writing copy for their newsletters, their press releases and their emails for both locations - Villa Park & Downtown Chicago. I assist them with marketing planning, reaching out to their vendors, general marketing ideas. I assist them with their social media (including Twitter, Facebook & blogging), audience development and engagement. I hope to get MacSpecialists blogging asap! In January, I managed their customer event with about 400 guests. MacSpecialist has several exciting events in the next five or six months so stayed tuned! They have Adobe webinars they host each month. They also have great training sessions for their customers. I am going to start a "Ladies Only" monthly seminar getting women in small business acclimated to web based marketing tools. You can follow them on Twitter for details @myMacSpecialist. I have worked with this client for several months, on/off. The sites are quite unique. They are aggregated lifestyle feeds. I think it is obvious what each one focuses on. If you navigate to the site, you will find a web based, aggregated feeds for Travel information, Fashion information and Foodie information. Each site is categorized into multiple areas for the convenience of the reader. You can also search the feeds by photos and "suggested feeds". The site are unique in that they allow people to browse Twitter without a huge time commitment. As you may already know, or maybe you don't. I worked for SUSHISAMBA for four years as their Event Manager in Chicago. I recently started to work with them again on a project basis. I consult for them regarding Social Media, help them identify opportunities in the space and communicate Chicago based events and promotions through their Facebook & Twitter pages. I also host their TweetUps. 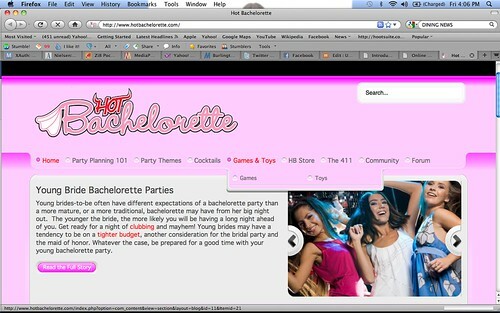 Another personal project that has turned into a full time job is Hot Bachelorette This is site is a work in progress. I feel like I am always developing this site and making it bigger. It is coming to life but still has a way to go. I wrote 90% of the content, @Mknox999 did most of my backend work in Joomla and Selcuk Arsan, my brother, developed the look/feel of the site including the logo. The site will hopefully monetize via affiliate links, paid advertisement from the "local directories", events and the HB store via data feeds. We shall see, I am still concentrating on developing the content.